update: It appears the threats of US officials, including John Bolton, have worked as Juan Guaido arrived unharmed and without being detained at Caracas airport on Monday. He was greeted by crowds of supporters and a number of European diplomats, and said to the group, "We are here in Venezuela. We are stronger than ever." He added, "We are going to achieve the end of the usurpation very soon in Venezuela." According to reports he noted that his arrival in Caracas shows that the Venezuelan people and armed forces are willing to ignore the Maduro regime's orders. He touched down on a commercial airline, Copa Airlines, from Ecuador were he had previously met with the Ecuadoran president.
.@JGuaido’s safe return to Venezuela is of the highest importance to the U.S. Any threats, violence, or intimidation against him will not be tolerated & will be met with swift response. The world is watching - Interim President Guaido must be allowed to re-enter Venezuela safely. Guaido is reportedly due to speak on Monday in Caracas' Plaza Alfredo Sadel where thousands have gathered to await his re-entering the country. US-backed opposition leader Juan Guaido plans to re-enter Venezuela on Monday after previously meeting with Vice President Mike Pence and other regional leaders in Colombia last week, and after visiting with the president of Ecuador on Sunday. The Maduro government, including Venezuela's Supreme Court, has said he could face up to 30 years in prison for violating a prior travel ban placed on him — something which the US has balked at, saying it would take action if Guaido were prosecuted or harmed. 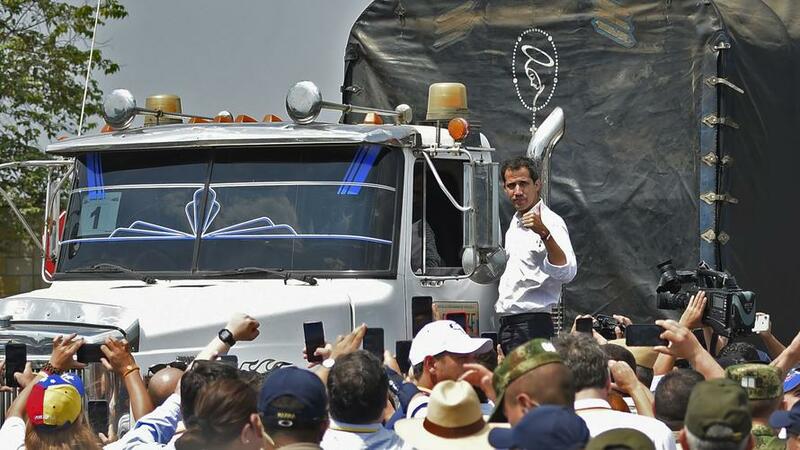 Over a week ago Guaido attempted to lead a humanitarian aid convoy across a bridge into Venezuela from neighboring Colombia. Significantly, Guaido invoked the some 700 total armed forces widely reported to have defected over the past weeks, most believed to have taken refuge in Colombia, to suggest successful "mobilization" and significant momentum. “I announce my return to the country and call on marches across the country for Monday and Tuesday,” he said on Twitter late Saturday. He said that if arrested by Maduro, it "would be a coup d'etat". In reality his crossing back into Venezuela will put himself at the mercy of Maduro's security forces, but on the same of day of Guaido's comments, National Security Adviser John Bolton wrote on Twitter, “Any threats or acts against his safe return will be met with a strong and significant response from the United States and the international community” — though it remains unclear just how far Washington would be willing to go should the self-declared "interim president" be seized. Maduro told ABC News in an interview last Tuesday, "He [Guaido] can leave and come back and will have to see the face of justice because justice had prohibited him from him leaving the country… He has to respect the laws." In a follow-up question concerning whether Maduro would have the opposition leaders arrested, the president said that only a court can make this decision. Meanwhile deputy judge of the Venezuelan Supreme Tribunal of Justice, Juan Carlos Valdez told Russia's Sputnik on the same day Maduro's interview was published that Guaido "may face up to 30 years in jail" for violating the travel ban. CNN: Do you not see US support for other dictators around the world undermines the credibility of your argument. Bolton: No, I don’t think it does. I think it’s separate. While U.S. President Donald Trump’s administration has not ruled out military intervention to dislodge Maduro, it is seen as unlikely and his Latin American allies have encouraged a mix of sanctions and diplomacy instead. Meanwhile, even as Maduro's regime has kept the political backing from allies like Russia, China and Turkey, any future financial support from those countries remains a major question mark and will be key to Maduro’s staying power.